The return of the Nephilim can be found In Numbers 13:28. This is the first passage since Genesis 6:4 to mention the former offspring of fallen angels. Click on a link to jump to that section of The Return of the Nephilim. 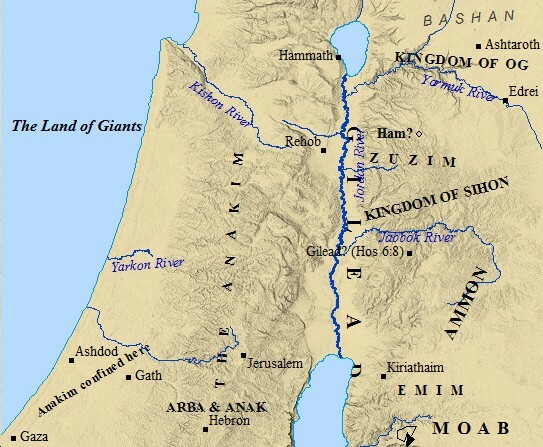 Map of Moses' Spies in Canaan. If one recalls, it was in the days of Noah these Nephilim were upon the face of the earth. They, along with their fallen angelic parents, wreaked havoc upon the earth, mankind, nature, animals, and all of God's creation. The Nephilim were a primary reason for God's severe judgment, resulting in the Biblical Flood. The narrative clearly states the flood was complete in its destruction of all life. Nobody, save Noah and his family, survived. Yet, here in Numbers 13, Scripture clearly states that the return of the Nephilim was readily accepted by the Israelites with no questions, but only fear. A satisfactory explanation for this anomaly in Scripture has yet to be laid forth. Theories abound, such as the one laid forth by Joe Schembrie, which diverges from a dogmatic view and presents an intriguing possibility. Any attempt to explain the return of the Nephilim is sure to be met with extreme skepticism and doubt by many "scholars" and "theologians". It would seem modern day academia is intent on explaining away the mysteries of the Bible. The return of the Nephilim in Numbers certainly qualifies as a mystery of the Bible. Share Your Thoughts On the return of the Nephilim Click to share your thoughts, comments, and questions on the Nephilim's Return in Numbers! 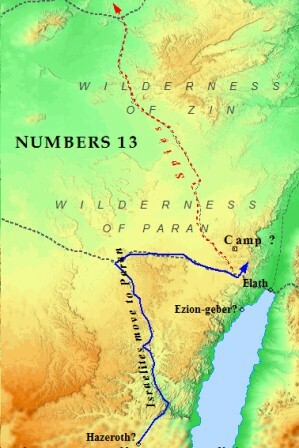 Deuteronomy 13 opens up with the Israelites camped somewhere in the wilderness of Paran. Moses had just moved the group from Hazeroth, following the Lord's banishment of Miriam outside the Israelite camp for seven days. The wilderness of Paran lie approximately 100 miles to the south of the Negev. The wilderness of Zin lie in-between the two. Moses was preparing to march the Israelites north, towards the Promised Land. In the opening verses of chapter 13 God gave Moses explicit instructions to send spies forward into the land of Canaan. "Then the Lord spoke to Moses saying, 'Send out for yourself men so that they may spy out the land of Canaan, which I am going to give to the sons of Israel; you shall send a man from each of their fathers tribes, every one a leader among them." Shammua from the tribe of Reuben, Shaphar from the tribe of Simeon, Caleb from the tribe of Judah, Igal from the tribe of Joseph, Hoshea from the tribe of Ephraim, Palit from the trive of Benjamin, Gaddiel from the tribe of Zubulun, Gaddi from the tribe of Joseph and the tribe of Manasseh, Ammiel from the tribe of Dan, Sethur from thet tribe of Asher, Nahbi from the tribe of Naphtali, and Geuel from teh tribe of Gad. The spies received very specific instructions regarding their mission from Moses in verses 17-20. They were to spy out the land thoroughly, gauging the strength of the people and their cities, as well as the agricultural state of the land. Moses even instructed them to bring back samples of produce from the land. Verse 21 gives the exact area surveyed by the Israelilte spies. Scripture does not indicate if the Israelites anticipated the return of the Nephilim or not. "So they went up and spied out the land from the wilderness of Zin as far as Rehob, at Lebo-hamath." Moses and the people had journeyed to Kadesh during the 40 day mission of the spies. When the spies returned, the whole congregation of Israel came out to hear their report. "Nevertheless, the people who live in the land are strong, and the cities are fortified and very large; and moreover, we saw the descendants of Anak there." "But the men who had gone up with him said, 'We are not able to go up against the people, for they are too strong for us.....There also we saw the Nephilim (the sons of Anak are part of the Nephilim) and we became like grasshoppers in our own sight, and so we were in their sight." Strangely enough, the spies report the return of the Nephilim to the land of Canaan. Remarkably, the Nephilim's descendants appear in the post-flood world! The phrasing of the passage is interesting as well. Notice in verse 31, the spies report the people of Canaan are "too strong for us". Then, in verse 33, they mention "also we saw the Nephilim". The added stress on "also" is to illuminate the return of the Nephilim to the land. In fact, they coexisted with some of the existing Canaanite societies. Based on the text in verse 33, it would seem these Nephilim were a separate group from Anak. Anak is mentioned in verse 28, then again in verse 33, when the spies relate they saw the Nephilim also. Anak and his descendants were just one branch of the Nephilim in the post flood world. The return of the Nephilim had evolved at this point to numerous different tribes (see Rephaim). The spies report to Moses that Amalek is living in the Negev. Also, Hittites, Jebusites, and Amorites dwell in the hill country. The Canaanites are living by the Sea, and by the side of the Jordan River. The picture is of a complex, heterogeneous mixtures of cultures, city-state kingdoms, religious systems, and languages. These people were Canaanites more geographically speaking, than culturally or ethnically speaking. EACH OF THE PEOPLES LISTED ON THE MAP IS SPECIFICALLY MENTIONED IN THE OLD TESTAMENT. ARBA & ANAK WERE SAID TO HAVE BEEN MIGHTY WAR LORDS. THE EMIM & ZUZIM WERE RELATED TRIBES OR CLANS. ALL WERE CHARACTERIZED BY GREAT SIZE & FIERCENESS. The Nephilim, thus, appear to have integrated themselves into Canaanite society as well, adding a dominant element. This behavior is eerily similar to that of the Habiru . The Habiru were a heterogenous mixture of people from antiquity who were exiled, forced to flee, or refugees from their original society. A number of reasons could have led to these individuals being separated from their native clans, or tribes. These Habiru were forced to integrate into foreign societies, as a result of whatever catastrophe befell them. The passage from Genesis certainly would qualify as a catastrophe for the Nephilim. 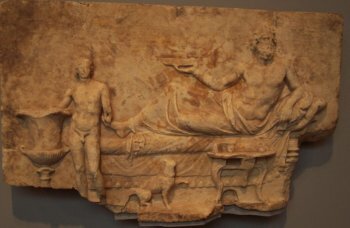 As previously mentioned, Anak and his sons were considered as "part" of the Nephilim. Anak and his descendants were merely one branch of descendants, living amongst the native population. The return of the Nephilim seems to have taken place some time ago, based on the various tribes associated with them. A natural inference is that other branches of Nephilim were coexisting in other cities throughout the land. In fact, the return of the Nephilim in the Old Testament primarily concerns kings of Nephililm stock ruling over vast kingdoms. The mention of Anak, specifically, makes sense geographically. Anak, and the Anakim (descendants of Anak), dwelt in the south of Canaan. Arba, Anaks' father, and also considered the greatest of the Anakim, had conquered Hebron at some point in the past. "Now he gave to Caleb the son of Jephunneh a portion among the sons of Judah, according to the command of the Lord to Joshua, namely, Kiriath-arba, Arba being the father of Anak (that is Hebron). And Caleb drove out from there the three sons of Anak: Sheshai and Ahiman and Talmai, the children of Anak." Three sons of Anak are given in Scripture. As follows, there were at least three generations of Nephilim in Canaan based on these Scriptures alone. Arba was the father of Anak, and Anak was the father of Ahiman, Sheshai, and Talmai. Though it is not explicitly stated Arba was alive at this time, it is not presumptuous to assume he was. Kiriath-arba translates as the city of Arba, and was previously known as Hebron. Hebron lies less than 20 miles south of Jerusalem. At least three generations of Anakim had been ruling in Hebron prior. Scholars disagree as to the exact length of a generation. To use a conservative, and by no means the exact length, number of forty years as a generation would place the return of the Nephilim at least 120 years prior to the conquest. As Scripture clearly indicates in the following chapters, Canaan is ruled by a number of Nephilim related kings. The spies would have been traveling northward from the Wilderness of Zin when they encountered Hebron. Though they probably encountered other settlements before, Hebron stood out due to the return of the Nephilim. As it turned out, the Nephilim lived throughout Canaan. Though Hebron was established prior to Abraham, it seems the Nephilim, specifically Arba, had taken control of the city, and claimed it as their capital. At this time, thus, it was known as the city of Arba, rather than Hebron. Eleven of the twelve spies Moses sent out reports the task cannot be done. However, Caleb, from the tribe of Judah, remained faithful. God, accordingly, rewarded the tribe of Judah throughout the Old Testament. The Davidic line of Kings hailed from the tribe of Judah. Jesus Christ is from the tribe of Judah, as well. Arba makes a few appearances throughout the Scriptures. His presence certainly implies a return of the Nephilim some time previous to the spies encountering them. 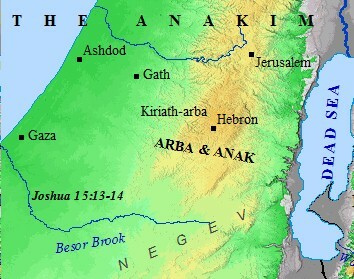 Joshua 14 claimed Hebron was named this due to the fact Arba was the greatest of all the Anakim. As he conquered Hebron, he renamed it after himself. Kings throughout the ages have followed suit, naming conquered cities after themselves for posterity. Arba surely was a fierce man, to be considered the greatest among these people. 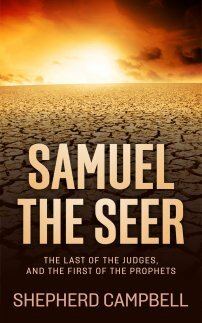 It is only after the Anakim are severely crippled that the land has rest from war. "So they gave out to the sons of Israel a bad report of the land which they had spied out, saying, 'The land through which we have gone in spying it out is a land that devours its inhabitants, and all the people whom we saw in it are men of great size." It is the post flood references to the Nephilim which lead people to associate them with Giants. The book of Deuteronomy mentions the Anakim in numerous passages. One such passage associates them with other tribes stemming from the return of the Nephilim to Canaan. "The Emim lived there formerly, a people as great, numerous, and tall as the Anakim. Like the Anakim, they are also regarded as Rephaim, but the Moabites call them Emim." Thus Scripture gives three groups of people associated with the Anakim. The Anakim, in turn, are tabbed as a part of the Nephilim. It becomes quite evident as one reads the Old Testament that these people became Israel's most feared enemy throughout the conquest, and into David's reign. The Anakim, Rephaim, and Emim were Nephilim branches living in Canaan at this time. It would seem the return of the Nephilim had taken place long ago enough for the different tribes to conquer a great part of the country. God was poising His people for another battle with evil. Another passage from Deuteronomy 2:20-21 draws a parallel between the Rephaim and the Anakim. "It is also regarded as the land of the Rephaim, for Rephaim formerly lived in it, but the Ammonites call them Zamzummin, a people as great, numerous, and tall as the Anakim, but the Lord destroyed them before them. And they dispossessed them and settled in their land." The verses prior to these two explain God's command to the Israelites. He is guiding them to the land opposite the sons of Ammon, and instructs them not to harass or provoke them. The land of Ammon is the land given to the sons of Lot. Scripture tells the land is also known as the land of the Rephaim. The Rephaim , like the Anakim, were great, tall and numerous. However, verse 21 relates how; "the Lord destroyed them before them". When this passage is closely examined, the circumstantial evidence is tantalizing. The first "them" mentioned refers to the Rephaim. The second "them" refers to the sons of Ammon, or, the Ammonites currently living in the land. Scripture seems to say, sometime prior to Lot taking the land, God destroyed a remnant of people living in Ammon. These people were related to the Anakim, who were related to the Nephilim. God, thus, drove these people out, and settled Lot's sons in the land, and gave them this land as a possession. Ammon is located northeast of the Dead Sea. God continued to honor Lot and his contribution to Israel. This reference to the Rephaim being destroyed may be a reference to the King of Chedorlaomer, and his coalition that waged war on Sodom and Gomorrah. Before reaching Sodom, the army defeated the Rephaim, and other groups living nearby. However, it may also refer to another destruction of the Rephaim, as the passage in Deuteronomy seems to suggest the Ammonites were the ones which displaced the Rephaim, and settled in their lands. Deuteronomy 9:2 again makes reference to the great and tall sons of the Anakim. "a people great and tall, the sons of the Anakim, whom you know and of whom you have heard it said,'Who can stand before the sons of Anak?' "
Not only were these people of immense stature, but Moses goes out of his way to stress how familiar the Israelites were with these people. They were well known and much feared by not only the Israelites, but by all the people living in the land. Verse 4 gives some insight into these post flood Nephilim tribes. This may be further evidence the return of the Nephilim had occurred some time ago. "Do not say in your heart when the Lord your God has driven them out before you, 'Because of my righteousness the Lord has brought me in to possess this land', but it is because of the wickedness of these nations that the Lord is dispossessing them before you." Again, the wickedness of people associated with the Nephilim drives God to destroy them. These were an exceedingly, and perpetually, wicked people, intent on defying God and His statutes. From their initial appearance in Genesis, to the return of the Nephilim in Numbers, God is constantly at battle with these individuals. In fact, Joshua is ordered to exterminate them from the land. They are to be utterly destroyed, and completely wiped off the face of the earth. Joshua, however, falls short of complete extermination, though he does reduce their influence significantly, confining them to three cities. Joshua 11:22 tells how Joshua drove the Anakim from the land of Israel, and confined them to the cities of Gaza, Gath, and Ashdod, all Philistine cities. Indeed, the Anakim were closely allied with the Philistines. Their confinement to Philistine cities illustrate this. 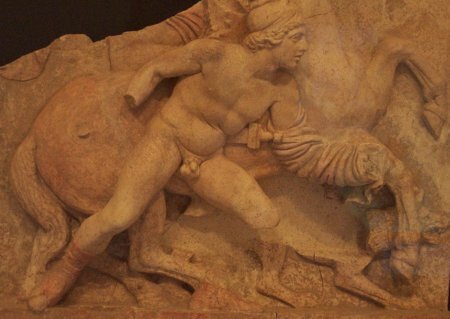 Though the Bible never explicitly relates the Philistines to the Anakim, or the Nephilim, by blood, it is clear there was a very strong influence within the Philistine culture. 1. The return of the Nephilim had taken place some time ago. 2. Over the years they had assimilated into other cultures, forming stronger bonds with some than others. 3. It would seem they formed such a bond with the Philistines. Whatever the blood relation may have been, the two shared an intense hatred of Israel and a reputation of ferocity in combat. It is no coincidence that Goliath, the giant slain by David, hailed from Gath. Gath, as mentioned above, was one of the three cities which Joshua drove the Anakim too. Goliath was called a Philistine. However, it is quite plausible he possessed some Nephilim genetics, due to his massive size. 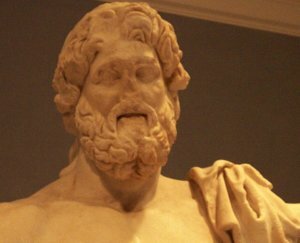 Over time, the Anakim Nephilim would have been fully integrated into Philistine society, and eventually would have called themselves Philistines. In conclusion, one cannot deny the return of the Nephilim in Numbers poses a question as to their whereabouts previously. Passages from Scripture seem to imply a steady presence throughout Canaan, dating at least back 120 years from the conquest. In all probability, the return of the Nephilim had taken place some time in the past. They seem to have fully integrated themselves into the land, establishing kingdoms in various parts of Canaan. The return of the Nephilim, just as their appearance in Genesis, is etched in wickedness, and they remained targets of God's judgment. These descendants of Nephilim angels and Nephilim giants once again wreaked havoc on the land, and waged war against God's people.